In mid January 2011, my wife and I got an idea to attempt to assist folks cornered with limited resources apart from families to reconnect in a real way with loved ones by the upcoming Valentine’s Day. We informed family and friends of our desire and requested letter materials, clip boards, and a battery powered camping lantern. 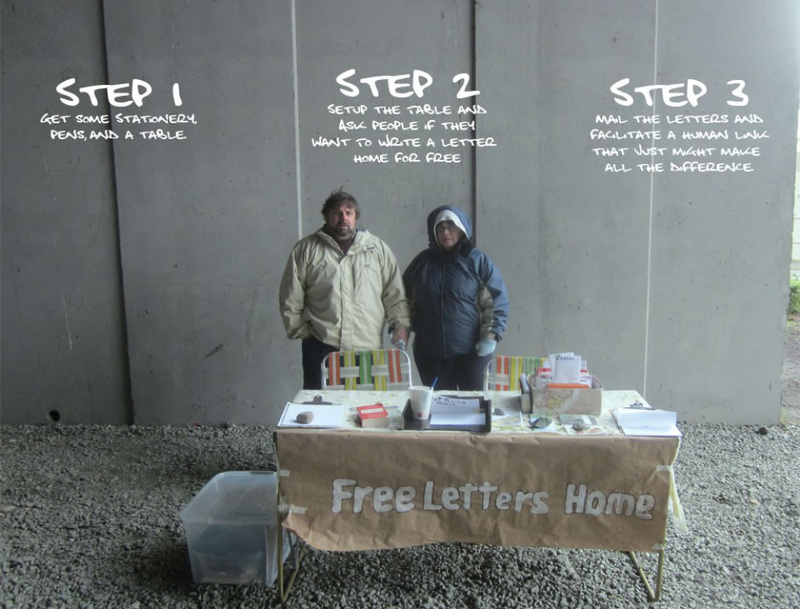 In the last weekend in January before church at first light, we launched with an old camping table, two lawn chairs, and our donated letter materials in a $5.00 plastic tub and hit the street. At that point, we changed our goal of a few Valentine’s cards back home, to four weeks of letters out. During that four week period, we thought what if we help other folks launch projects in their own communities of Free Letters Home. We felt we could seed this idea by having a rubber stamp made directing receipts of cards and letters to a website with helpful tips and information. Greg & Stacey – I read about you in this month’s Guideposts and would like to donate a big box of cards that I have to you. How would I go about doing this? Thank you for all you do to help the homeless in your area keep in touch with their loved ones! You’re welcome, glad to help! I’ll try to mail them out tomorrow or early next week. I know when I want to get back in touch with someone, it’s intimidating to start from a blank piece of paper. Sometimes the sentiment on the card helps me to figure out what I want to say! That is so true. The people who come up to the table wanting to write a letter usually know what type of card they want (Birthday, Thinking of You, Get Well, etc. ), but they do like words already written inside to help get them started in what they want to say. During the visit, we offer lined paper to supplement the cards, so that people can have additional space if they want to write more. This is a great thing you started. I would like to start this as an outreach from my church. I would appreciate any advice you have thanks. I’m interested in getting involved with this project! Do you know if a Free Letters Home Project is up and running in the Des Moines, Iowa area? If not please send me info and tips on how to get started. Thanks! Brenda, Are you needing materials to start up? I will send you an email for further information. This is a terrific idea! Am going to do my best to set something like this up in Bakersfield. Any advice you can spare would be appreciated. Plz continue your blessed work! Thank you Tori, Tell your friends what you are going to do. Everybody has used use stuff in the back of their desks. I have never had to purchase anything. Take a friend out with you. you should get something out of this too. When a visitor tells you that the letter will make someone cry with happiness when they receive the letter you will feel great about your efforts. Tori, How is it going setting up in Bakersfield? Do you have any questions, or are you needing help with materials?